At the April 17, 2018 BOC Meeting the Commissioners unanimously voted to withdraw all requests for permits to construct a terminal groin thereby ending the project. The Board passed Resolution 18-02 stating their reason for killing the project and directing the Town’s environmental attorney Clark Wright to communicate the decision to the Corps of Engineers. The Final Environmental Impact Statement has been released. You may access it by clicking here and then by clicking on the Holden Beach link. The report is 1,898 pages and is broken into sections for downloading. The Corps of Engineers, Wilmington District will receive written comments pertaining to the proposed work until 5pm, April 16, 2018. Comments should be submitted to Mr. Mickey Sugg, Wilmington Regulatory Field Office, 69 Darlington Avenue, Wilmington, North Carolina 28403, (910) 251-4811. HBPOA has requested an additional 30 days for comments, but it is not clear that the extra time will be granted. The HBPOA Terminal Groin Study Committee has reviewed the document and presented a summary to the Board and membership at the Easter Meetings. A vote was taken. The Holden Beach Property Owners Association has concluded that the nourishment efforts performed by the Town over the past 15 years have been very successful and cost-effective in protecting the east end of the island, and that the additional costs and risks associated with a terminal groin are not justified. 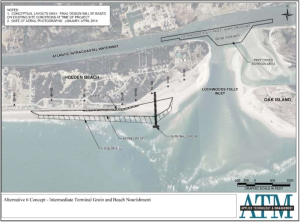 The attached material provides the basis for this position, and the includes the resolution that was passed by the HBPOA members during their meeting on March 31st urging the Board of Commissioners to continue with the same nourishment and Lockwood Folly inlet strategies from the last 15 years, and to stop spending the Town’s money and resources in pursuit of a terminal groin. As an organization, HBPOA has not taken a position on the groin. Our members have indicated that they need more information to take a position. At the Easter 2016 meeting a motion was passed to host an information session on the groin. This was scheduled for April 29, 2016 and the Town along with firms contracted by the Town to prepare the EIS for the groin (Dial-Cordy Associates and ATM) were invited to attend along with the Coastal Federation and the Southern Environmental Law Center. Dial-Cordy declined to attend and the Town and ATM did not respond. HBPOA was quoted in this article. The information session was recorded. You can view the slides or listen to the meeting while viewing the slides here. 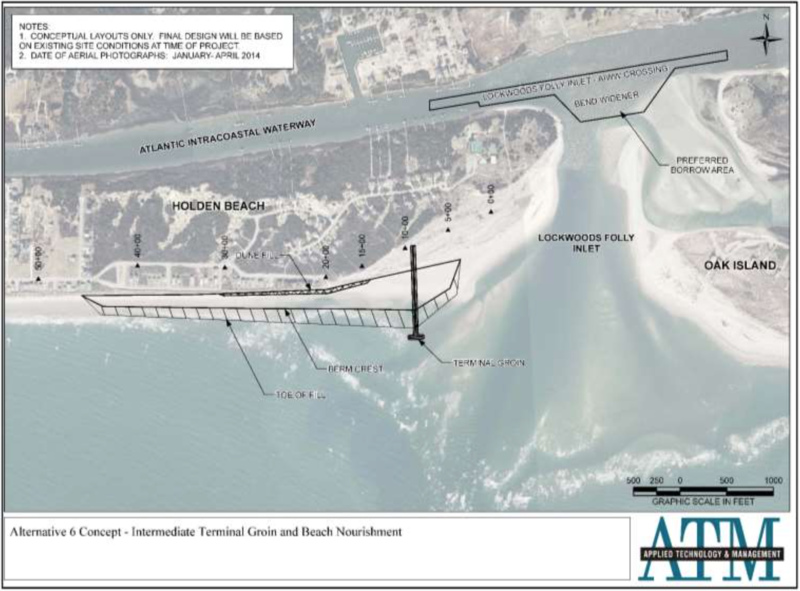 The Army Corps of Engineers has released the Draft Environmental Impact Statement (DEIS) for a terminal groin on Holden Beach and hosted a Public Meeting on September 24. Comments were accepted through October 13. Currently, the Corps of Engineers is reviewing the comments and making the determination whether to issue the permit for the groin or not. The proposed groin will be 1000′ long and have a 120′ “T” section at the end. The groin will reach 700′ into the ocean with the remaining 300′ on the beach and be constructed of 4- to 5-ft-diameter granite armor stone. The crest of the groin would be approximately ten feet wide and the base would be approximately 40′ wide. Total cost of the groin is estimated at $34,410,000. We encourage you to review the DEIS and become familiar with it and the appendices. Coastal and environmental groups are opposed to the groin. The North Carolina Coastal Federation in conjunction with the Southern Environmental Law Center and Audubon North Carolina has launched a website explaining their concerns. There are also links to more information on the site. Graduate students at Duke University used the issue as a class project to determine what property owners understand about the effects of terminal groins on beach erosion and what are property owners’ preferences regarding erosion interventions. A survey was sent to property owners in the spring of 2016. The results of the survey are here. Our contact at the corps of Engineers was Ms. Emily Hughes, Wilmington Regulatory Field Office, 69 Darlington Ave. Wilmington, NC 28403, or by email to: Emily.B.Hughes@USACE.army.mil You can also contact Ms. Hughes at 910-251-4635.